Low carb & ketogenic diets are great for improving health in many ways like reducing metabolic syndrome issues, weight loss, physical & mental performance boosts, plus loads of other health benefits. But, one thing to remember is that it’s not perfect. Certain minerals or vitamins are definitely lost and need to be replenished. If you start to feel weak, get muscle cramps, have skin problems, are irritable or moody then a low level of potassium in your system might be the culprit you need to fix. I’ve found a few different potassium supplements to help you stay keto, plus feel good. We all know Nature Made brand. They’ve been around for over 40 years and have that bright yellow label that’s easy to spot on the store shelves. So is it any surprise that they would show up in my top 3. 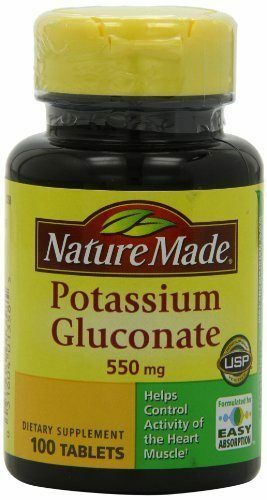 With Nature Made Potassium Gluconate, you have a supplement that is trusted and approved by the United States Pharmacopeia (USP). Since low carb diets are known to deplete potassium, it’s important to make sure to increase potassium intake on a daily basis. You can do this by eating foods high in potassium – such as spinach, kale, and bananas – and a taking a trusted supplement. A potassium supplement, like Nature Made Potassium Gluconate, can help prevent you from having to deal with the symptoms that seem to go hand-in-hand with a low carb or keto diet. Not having enough potassium in your diet can cause you to become irritable (no one wants to be around a grouch), to feel weak, get muscle cramps (those are the worst! ), and you may even experience skin issues (remember puberty? Yeah, not fun). Nature Made Potassium Gluconate is safe and easy to add to your daily routine if you don’t want to eat your greens like Popeye. Suggested daily intake is one tablet with a meal. See your doctor before taking more than one tablet. 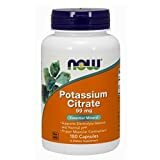 The NOW Potassium Citrate is another option to boost and maintain your potassium levels when on a low carb or keto diet. Like Nature Made, NOW Foods has been around for almost 40 years. Unlike Nature Made, NOW has expanded into essential oils, beauty products for hair, skin, and nails, sports nutrition, natural foods, and pet health supplements. So NOW upped their game a bit and they’ve taken their Potassium Citrate supplement right up to the level of what is legally allowed in the US for the daily dosage of a potassium supplement – 99 mg. As long as it stays under 100mg, then they’re still considered safe and legal. Remember the keto flu symptoms I told you about when you’re on a low-carb or ketogenic diet? 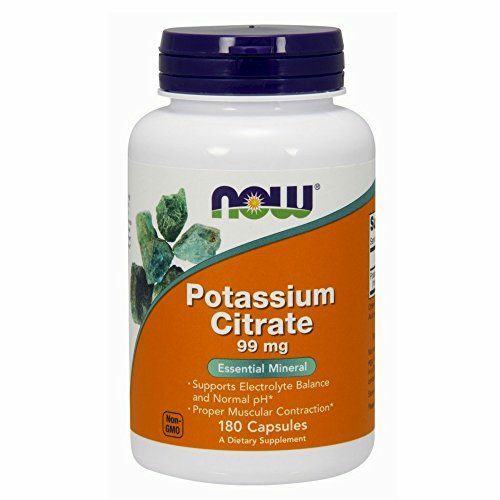 Potassium citrate is another way to make sure your potassium levels don’t drop too low and to prevent you (or those around you) from having to deal with any of the irritability, muscle cramps, and skin issues, to name a few. You also get option of the NOW Potassium Gluconate tablets with 99mg of Potassium. 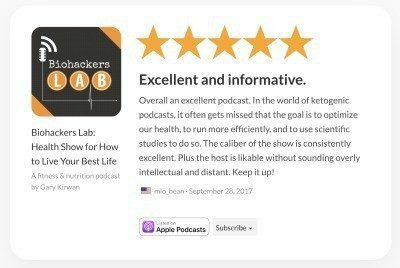 But for the purpose of this review and the keto diet, I felt their Potassium Citrate supplement was a better option. 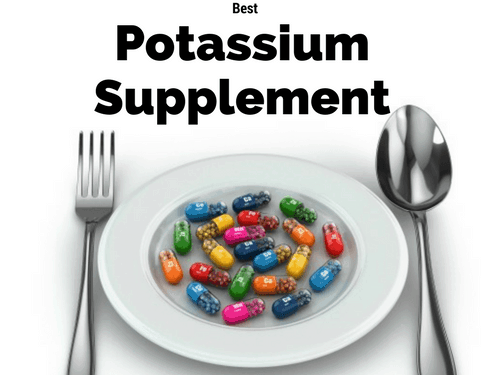 For those of you that have just slightly lowered potassium levels, this supplement is a simple way to give those levels a boost since you only take one a day. Approved by the National Products Association, another non-profit dedicated to keeping safety and health standards for the natural products industry. Because it’s a low dose, it may not help to boost the potassium levels to where they need to be on its own. You’ll still need to supplement your potassium intake using healthy keto friendly foods like spinach and avocado. The Solaray Potassium supplements round out my picks for the best potassium supplements to take when you’re on a keto diet. Solaray is the premium brand in the nutraceutical family of brands. They may not be as well-known as Nature Made or NOW, but they have been around the longest of the three. 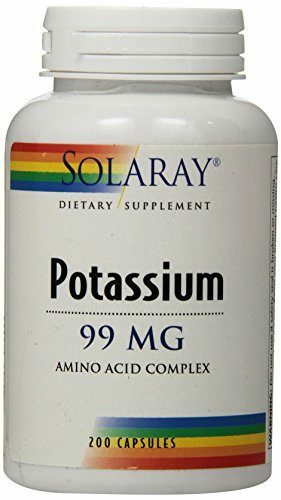 Like the NOW option, Solaray’s Potassium Amino Acid Complex has 99 mg of potassium as a Potassium Amino Acid Complex. It’s right there on the border of what is considered legally safe by the Food and Drug Administration. As with the other two on this list, Solaray’s supplement can also help balance out low levels of potassium that are all too common when you’re on a low-carb or keto diet. Even though this is 99 mg, you still have to supplement your potassium intake with foods like kale, bananas, and avocado. If you’re not a fan of fruits and veggies, why not give try guacamole or chocolate covered bananas a try? Solaray’s supplements are approved by the United States Pharmacopeia (remember them? ), and they meet the FDA requirements for labeling. Their products are also free of artificial colors, flavors, and preservatives. Solaray also does a final test searching specifically for gluten before they declare and label their product is gluten-free. Take potassium tablets with or just after a meal for optimal absorption. It is normally well absorbed in your small intestine with about 90 percent being absorbed during the process of digestion. You’ll be taking it two to four times per day. There is no set upper limit for potassium. That means it is not clear exactly how much potassium you can safely take per day. However, very high doses of potassium can be deadly. Muscle weakness or paralysis, irregular heartbeat, confusion, tingling sensation in the limbs, low blood pressure, and even coma. You can use this guide to find the supplement that will work best to keep your levels balanced.